Sweet cicely, otherwise known as garden myrrh, is often a garden escapee and was formerly a widely cultivated culinary herb. It is said to have been strewn on the floors of churches in medieval Britain, presumably for its scent. It is therefore considered to be an introduced species rather than a native one. The plant is renowned for its aniseed taste and fragrance and there are many recipes which use different parts of the plant: the roots can be boiled; leaves added to salads; seeds added for flavouring. The plant has also been used as a wood polish creating a deep lustre on wooden surfaces. This early flowering perennial plant is often a striking component of road verges in the Yorkshire Dales National Park in May and June. 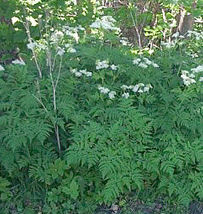 Sweet cicely is often confused with its relative cow parsley (Anthriscus sylvestris). However, sweet cicely has a bushy, more ‘feathery’ appearance than cow parsley and the crushed foliage has a very strong aniseed scent. The large seeds ripen in late summer but frequently stay on the stems until winter. Basically, this rather unusual dish is a sweet Yorkshire Pudding. That may sound weird, but it's a traditional dish that's well worth trying. Just remember that the 'rhubarb triangle' is in Yorkshire and the combination of rhubarb and Yorkshire pudding is a true Yorkshire dish. Place the rhubarb in a bowl, cover with boiling water then drain and add the sweet cicely. Meanwhile heat the butter and oil in a pan and when the sugar has melted pour into the base of a 1l baking dish. Place in an oven pre-heated to 200 degrees Centigrade and bake until the oil bubbles but does not brown. Lightly beat the egg whites then incorporate the flour, milk and raisins. Pour this mixture into the base of the hot baking tin. Immediately sprinkle the rhubarb and sweet cicely mixture over the top (leaving a 3cm gap around the edge of the pan). Return to the oven and bake for 20 minutes, or until the top has browned. Now melt the remaining butter in a pan and stir-in the brown sugar. Allow to cook until syrupy then drizzle over the top of the pudding. Serve with custard or yoghurt.